The miniature pinscher on the alert. Although they're both small dogs with similar coloring, these two breeds are unrelated. Both developed as vermin hunters, so if you have rats or mice and don't like cats, either can fill the bill. Otherwise, temperamental differences may seal the deal if you're deciding between them. The Manchester terrier comes in two sizes, the toy and the standard. The toy terrier weighs up to 12 pounds at maturity, while the standard ranges between 12 and 22 pounds. The min-pin, as they're often called, weighs between 8 and 12 pounds and stands between 10 and 12 inches at the shoulder, a height similar to that of the toy Manchester. 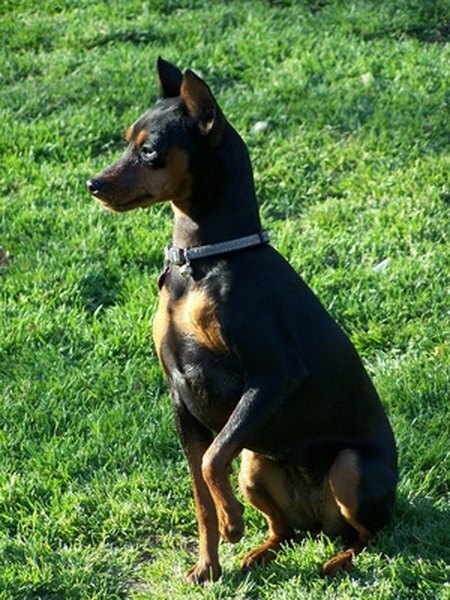 The standard Manchester terrier stands 15 to 16 inches at the shoulder. The Manchester terrier traces its roots back to the oldest type of terrier, the black-and-tan of England. It retains that black-and-tan coloring to this day. The min-pin originated in Germany, and reputedly shares some bloodlines with the dachshund, Italian greyhound and German pinscher. It is not a miniature version of the Doberman pinscher. The Manchester terrier has a strictly black-and-tan coat, with the colors clearly delineated and not running into each other. There are tan spots over the eyes, along with little tan spots on each of the dog's cheeks. While the muzzle is tan, the nose is black. Under the throat, the tan area forms a V shape. The min-pin may appear in several colors, including solid red. He can also have the same coloring as the Manchester terrier, or similar markings with chocolate and rust instead of black and tan. If you're athletic and want an athletic little dog, your best bet between these two breeds is the Manchester. He's also a good little watchdog—no one gets near your place without your knowing it. He's a bright, energetic, loyal little guy. On the other hand, don't tell your min-pin that he's a toy dog. He thinks he's a big dog in a little dog's body. Also a good watchdog, he's a fearless, self-assured fellow who doesn't require as much exercise as the Manchester.